The U.S. Senate has now officially moved to limit the amount of post-cloture debate time for sub-Cabinet executive nominees and judicial nominees other than the circuit and Supreme Court level…. 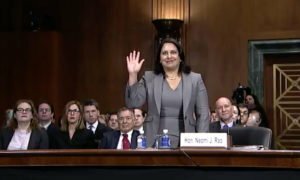 Neomi Rao, President Trump’s nominee to be a judge on the D.C. Circuit Court of Appeals, often recognized as the second-highest court in the land, was confirmed by the U.S…. 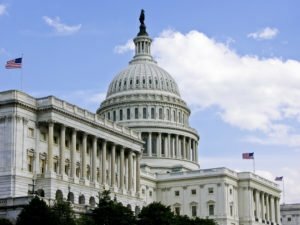 The U.S. Senate has now officially moved to limit the amount of post-cloture debate time for sub-Cabinet executive nominees and judicial nominees other than the circuit and Supreme Court level. Debate time will be limited to two hours as opposed to the usual thirty. The move was (unfortunately) desperately needed after the unprecedented and unnecessary obstruction campaign that Democrats have launched against President Trump’s nominees. There are a total of 152 vacancies in the federal judiciary (88 considered a judicial emergency) and 68 nominees pending in the Senate. Forty-seven of those are simply awaiting floor votes. Forty-one of those have waited more than a year. Four of those have waited more than 500 days. It is not that senators have raised specific, substantive objections to these nominees. The Democrats have simply taken the position of treating virtually every nominee as hostile merely to slow down the process as much as possible, even though they might even vote to confirm them in the end. Under normal circumstances, unobjectionable nominees would be passed by a voice vote, requiring no time to end the debate. But President Trump has faced 57 votes to end debate on judicial nominees during his first two years in office, far more than under previous presidents. President Barack Obama had only faced two at the same point in his presidency. President George W. Bush had seven at that point, President Clinton merely one. It is not only judicial nominations, either. John Ryder was confirmed earlier this year to the Board of Directors of the Tennessee Valley Authority (TVA). He lingered for more than a year, awaiting a floor vote for some nine months, only to be confirmed with a simple voice vote. There is nothing fair about such a process. One of the things liberals forget in their petty fights against President Trump is the fact that they are harming the lives of these nominees who have families and are being put through this unfair process for no reason of their own making. Emotional sentiments against the president should not be allowed to control the nominations process. This rule change then essentially restores a fairer procedure where nominations who are not objectionable are able to be confirmed at a sensible pace. There is nothing radical or extreme about that. There is no court-packing scheme in play here, despite what you might hear in the mainstream media. Senate Majority Leader Mitch McConnell (R-Kentucky) is actually following a precedent already established by former Democrat Majority Leader Harry Reid (D-Nevada). Following the Reid model, Leader McConnell made a point of order to establish the new rule, which was ultimately upheld by a simple majority vote (51-48). This procedure establishes a new precedent while avoiding a formal rule change which would require a supermajority to end a filibuster. The rule change will speed up the confirmation of lower-court nominees considerably. To further illustrate the point, the Senate has just confirmed three district-court judges to this point in 2019. That is simply unacceptable. It was time for this change. It is time for the Senate to get to work.